At the beginning of this story, the old is questioned by new ways of thought and living life. For this book by Jaspher Rori, who used to be a high school teacher and currently is working on another book, the old represents the ways of Manga, Kenya. Manga, Kenya is a village where drinking home-brewed beer, smoking tobacco and having children so they look after your cattle is the spiritual way of life. Enter the ways of the new – white missionaries. Carrying the Bible in one hand and a gun in the other, the white missionaries preach the glory of Jesus Christ absolving all of their sins and their brand of education is the solution to a prosperous life. Indeed, the message was enticing. But the Gusii had known encore, their god, as the source of life, all knowing, all present and powerful. He and only he directed their lives and knew even where the wind slept. He lived high beyond the sky from where he watched over them and directed their lives. He was a god of mercy and plenty, and when not pleased with the people, he rained disaster as a lesson. Therefore, they knew how to please him through regular sacrifices and rituals (Rori, 2011, pg. 2-3). The white missionaries insisted while holding their guns, that Jesus Christ was more powerful. Thus, schools were built in the village, not just in Manga, and the Gusii lost their offspring to classrooms and their money to missionary schools, rather than tending to their farms. In villages outside Manga, there were Kenyans who were achieving high levels of success, defined by the white missionaries’ promises. Government officials, doctors, and lawyers they were becoming. Until Musa, who was the first from Manga to go to university, the village of Manga was losing hope. Musa is the beacon of hope and the light of Musa flickers as the embers creep through the wood for a campfire in the rain. When Musa leaves his village of Manga to go to university, he meets Judith. Judy is a woman of promise, for a future with Musa, as well as for her own future. Once they graduate, developing a friendship and a spiritual bond of love, they promise to keep in touch – as what happens with so many young lovers, the promise is not kept. Both Musa and Judy aim to ride the wheels of fortune in Nairobi. Their village ways need to mutate into the glossy white success standards of the city. Judy rides these wheels first, however, falls into a devastating snare of drug trafficking that ruins her career. At this time, Musa rises to finally become the beacon of hope for his village, for himself, and for the failed destiny of Judy. On a personal note, this book helped me to understand why so many people hold the idea that Africa does not work as a continent. My father would often tell me stories about how wonderful his homeland of Uganda was when the British ruled. He would give examples of milk being delivered to the door. For those of you who remember Idi Amin, the comparison to British rule is maddening. 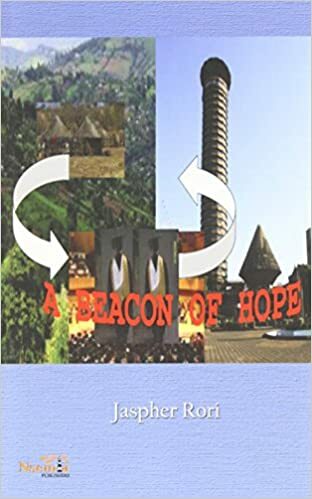 In Jaspher Rori’s book, he does not discuss the often bemoaned “brain drain” of the African educated elite, however, focuses on Musa, who grasps at trying to make his family, his village and his nation of Kenya proud while he searches for work in Nairobi. On a universal level, anyone who has ever struggled to find work anywhere in the world can relate to Musa, trying to be an adult, trying to find a good person to marry, and trying to be “successful” by white missionary standards. Why does Africa not work? Read the book to give you some insight.